Nestled in the southern reaches of the Satpuda Hills, Pench National Park or Tiger Reserve is the original setting of Rudyard Kipling’s most famous work, The Jungle Book. The jungle camp is 12 acres in area, right in the heart of the reserve, and offers you a host of luxurious facilities and comforts that are sure to make you keep coming back for more visits. Apart from the tigers, that is. 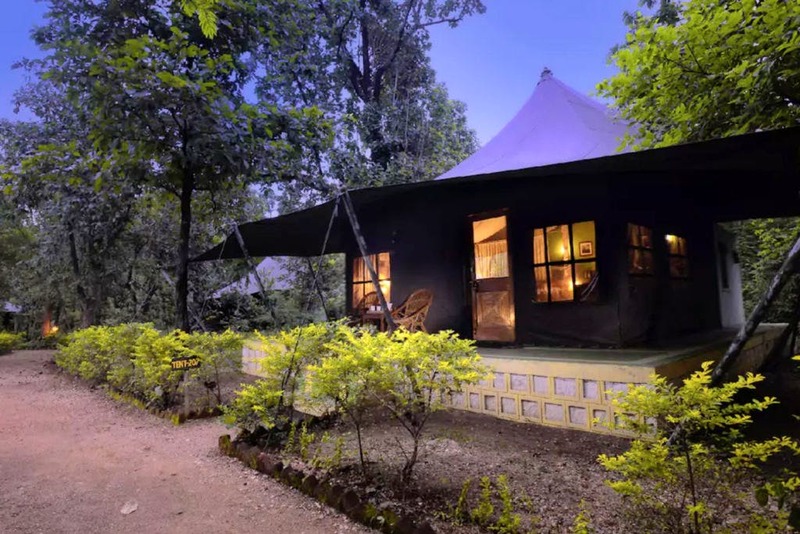 The air-conditioned safari tents are pretty as a picture with facilities like a luxurious bathroom and even a sit-out verandah – all jungle-themed. The interiors are neo-ethnic and tastefully done up. The camp also has a common fancy dining area, a lounge with a great collection of books and periodicals, a swimming pool to help cool you down, a health spa and even a well-equipped conference hall in case you’re planning an offsite (‘cos we totally are). Apart from this, you can also indulge in ATV biking, zip lining, going on nature walks, bicycling, being a part of the tribal dance, or even just chilling out at the library. If you’re planning to spend a special day here, they can also arrange for special bonfire dinners or even a romantic pool candlelight dinner. Sounds just about perfect! It’s probably one of the coolest places if you’re a nature lover. Apart from that, what’s gotten us hooked is the fact that the Jungle Book is based out of this forest. I mean… we don’t really need to say anything else. If you do decide to take our advice and visit this holy grail of jungles, it’ll cost you INR 10,000 approx. per night. While it might be a bit steep, it’s sure to give you that precious memory you can hold on to for a long time to come.